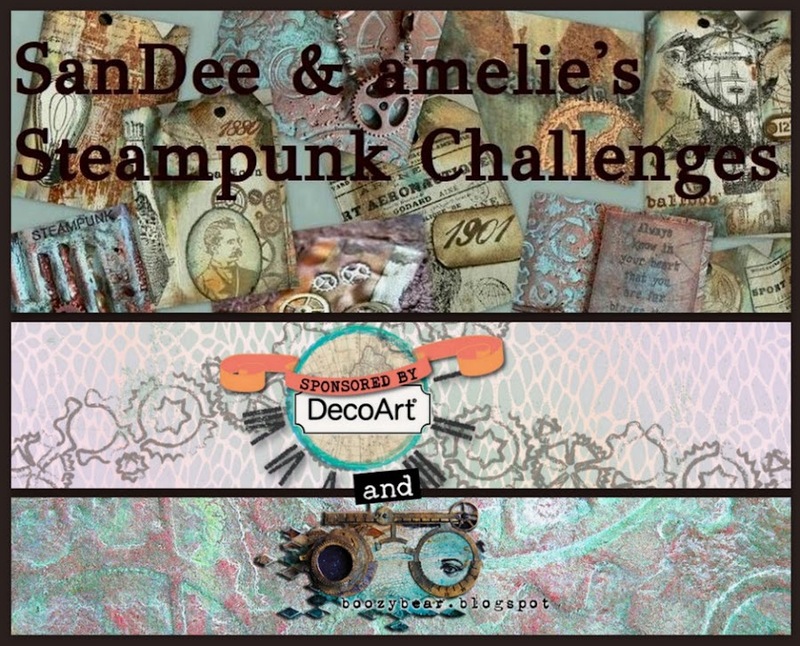 A hearty welcome to SanDee&amelie's challenge blog! Please, note, that this challenge blog is not related to any business and run without any profit by people, who do this for your and their own leisure time fun! 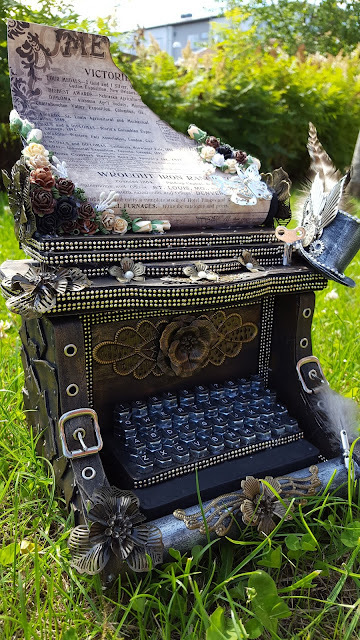 Our only reward are your encouraging comments and your playing along and sharing steampunk fun and mixed media techniques. We appreciate every single entry and comment so much! Thank you for taking the time! If you are new to this place, please, know that we are so glad that you stopped by our little steampunk corner! 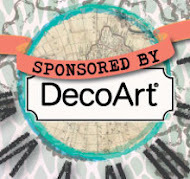 Whether you are a dedicated tag or card maker, art journaler or mixed media lover - this might be the right place for you! 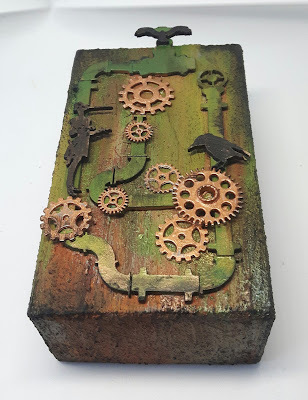 For more information about the rules and the little "steampunk/industrial twist" we ask of you, please check the "about" stuff and then simply jump in and create! 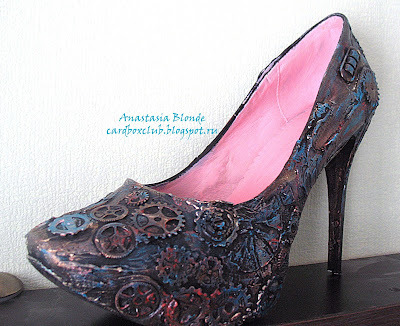 If you are new to steampunk and not sure if this is "your thing", maybe take a look at our winners gallery on pinterest (use the linking button on our side bar). 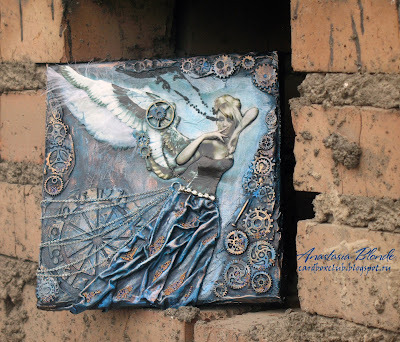 You will find that we're mainly a mixed media challenge blog with a little twist towards steampunk, industrial and/or vintage. So why not give it a try? We are looking forward to seeing your fab projects entered to one of our challenges soon! Servus and welcome back to our usual mid-monthly share of the inspirational makes of Team B! And I am using this opportunity to welcome all our new players who have joined in during the last few months! This place is constantly growing and attracting more and more fabulously creative people from all around the globe and we are so proud of that - but I also know that part of this is due to our players, my fab Design Team and our prize sponsors, who all make this place the special mixed media spot it is! So thank you for being so true and for sharing your fantastic mixed media art with us so constantly! Our aim is for you to find a lot of fun and inspiration by playing along and during your visits here and also by visiting the blogs of our players and the DT! We are open for all sorts of crafters and artists, for all levels of skill and all kinds of stamped, painted, collaged, drawn,...well, media-mixed projects as long as they are handmade. 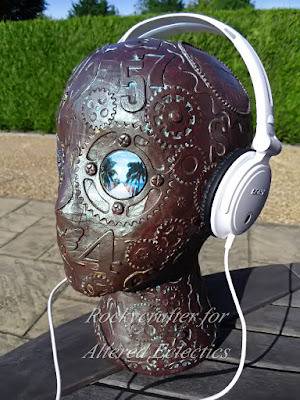 These can be cards, tags, altered objects, altered art jewellery, canvasses, art journal pages, assemblage pieces...well, whatever you can think of. 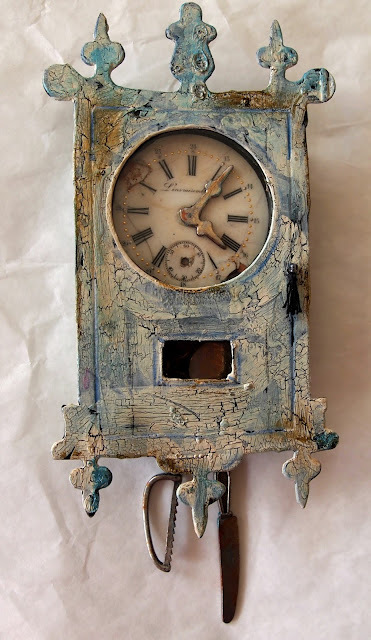 All we ask for is that your projects are either industrial or steampunk style mixed media projects. It's that easy and that fun! Our challenges are open for a whole month and you can either make our Top5 (who are being chosen by the whole DT) or/and win one of our two monthly prizes donated by our generous sponsors DecoArt media and boozybear. All you have to do is stick to the few challenge rules (that can be found on an extra page right under our challenge blog header) and enter up to three projects! We would also love it if you took a second or two to visit the blogs of the DT (for more information and images and maybe even a how-to here and there) and leave a short comment of approval! You get to their blogs by clicking on their names. And be assured - you will make them very happy by doing so! You will find the linky tool at the bottom of this post. decided to make an industrial style project this time. his ornate frame die and some shrink plastic. There's a how-to on my blog. to create this awesome vintage travellers tag. 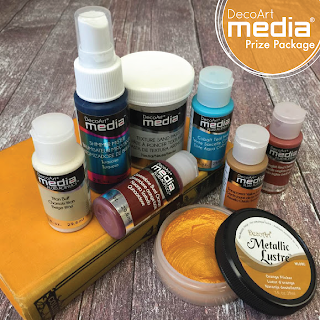 (stencils, embossing powder, distress ink and "lots of metal tidbits"
If you haven't checked out our Top5 and prize winners from the summer special challenge yet, just click HERE. 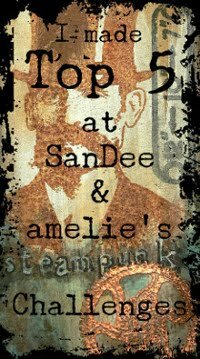 see you soon - entering your steampunk/industrial projects to our challenge! Prize Winners and Top 5 of Our Summer Special 2016! to the announcement of our prize winners and Top5! The team and I want to thank you all so much for playing along so willingly during the hot summer months and for entering those fantastic loads of awesome mixed media steampunk and industrial art! We were once more blown away by your talent and by you all being such true players. 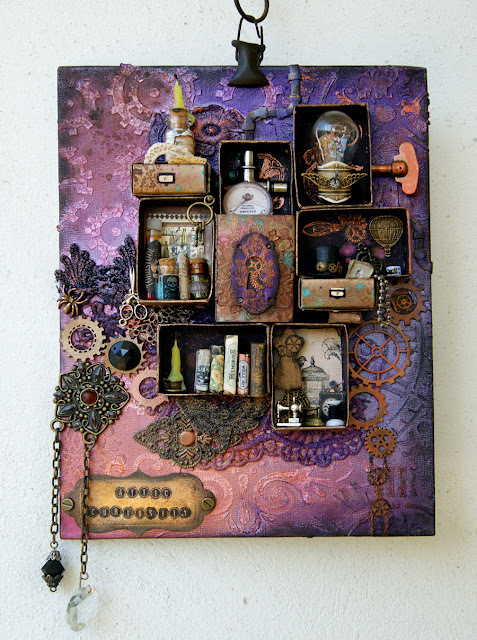 It's you who make our little mixed media steampunk corner the special place that it is - and for that we are so grateful! Also special is that lovely Glenda, the shop owner and designer of the fantastic boozybear steampunk chipboard pieces, is generously giving away two surprise prize packages this time - so we have three prizes for three lucky winners - including the little "steampunk starter kit" from our generous prize sponsor DecoArt media). Yay! Huge congrats to all the lucky winners! Have fun with your goodies! Please, email me under vonpappe2@yahoo.de so we can fix everything for a quick delivery! DecoArt prize winners, please, add your phone number as DecoArt require it for shipping to your place. Thank you so much for playing along and sharing your art with us and huge congrats to all of you! I know I keep repeating myself when I say that your work is so inspiring and mind-blowing - but that's what it is! Please, feel free to grab our Top5 badge for display on your blogs! ...and don't forget to come back to this place on the 15th, when Team B will be sharing their projects! Hello, servus and welcome back after the summer break! The Top entries and prize winners of our summer special challenge will be announced on Saturday, 10th September - so make sure to pop by to find out if you are among them. We had a wonderful load of awesome entries - so choosing will be tough again (but as always so inspiring)! 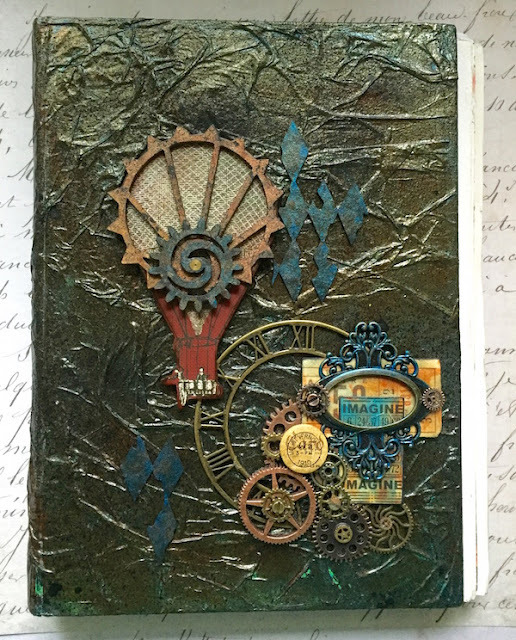 Thank you all so much for playing along and sharing your mixed media -, tag -, card -, altered - and other steampunk/industrial art with us! Team A have created a bundle of fabulously inspirational pieces to kick off our September challenge! Please, make sure you visit their blogs for more information on their makes and maybe even leave a short comment as a little encouragement and reward for their efforts there! (you get to their blogs by clicking their names). Team B will - as usual - follow on the 15th! 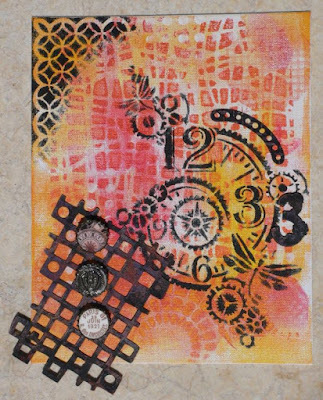 made a canvas on which she used a self made Gelli plate background alongside some stencilled texture, embellishments and altered bottlecaps. 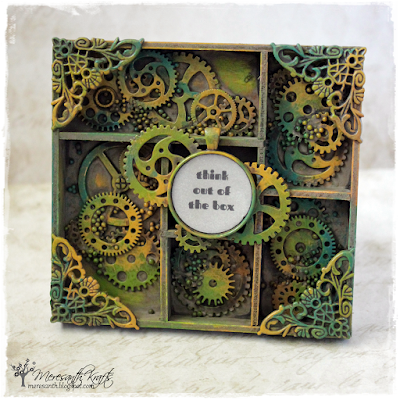 suggests to "get those cogs turning...outside the box ;) "
Get inspiration and challenge updates on Instagram too. Join our new Open Studio on facebook! Just click on the button to get there. Grab our badge for display on your blog! We do not take responsibility for any content on blogs that are linked to our challenges via the inlinkz tool. Nor do we take responsibility for any other content reachable via external links.